Celeste Hicks visits the unique Ethiopian churches of Lalibela. The mystery of Lalibela is just how did they do it? 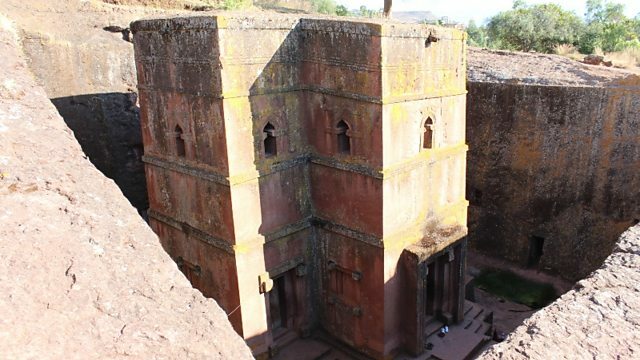 Eleven exquisite churches, differing from each other wildly in size, shape and style, connected by a labyrinth of underground tunnels, all carved by hand from a huge mound of volcanic rock in the Ethiopian highlands. Legend says it took the 12th century King Lalibela - inspired to create a new holy land after a visit to Jersusalem - just twenty three years to build the churches; but just a handful of tools have been uncovered by archaeologists and next to nothing is known of the labourers who created them. Lalibela inspires wonder from local Ethiopians and the scores of tourists who visit it from all over the world . But these churches are not just static relics of a forgotten age, they live and breathe. Every day as the sun comes up over the 4000 metre peaks of Lalibela, local people spend a quiet moment praying to their favourite saints and the Virgin Mary. The Ethiopian Orthodox calendar is alive with special saints' commemorations days and festivals long fallen into obscurity in Western Christianity. On these days, pilgrims from all over the country arrive to pray at the churches, while priests chant ancient liturgical songs, wave incense burners and play traditional instruments throughout the night. But can these traditions - which some say connect Ethiopian Orthodoxy back to the Biblical King Solomon and placed the church at the heart of the political establishment for some 1500 years - stay vibrant in a fast-changing modern world? The Orthodox church has been criticised by many for outdated practices such as kissing pictures of saints and focusing on sacred texts which are not in the Bible. As Ethiopia's economic development takes off, thousands of Ethiopians in urban centres are being attracted to a newer breed of more charismatic and dynamic Protestant church. Added to this the country's large Muslim minority is pressing for greater political representation, and for the first time, the country's Prime Minister is not from the Orthodox Church. Ethiopia is well and truly changing. Celeste Hicks travelled to Lalibela to hear how Orthodoxy respond to these challenges, and just how strong the emotional attachment is of ordinary Ethiopians to their unique church.